NIALL Ó DONNGHAILE – one of the key speakers at this year’s National Hunger Strike Commemoration – was born in 1985, four years after the H-Blocks Hunger Strike in which ten republican prisoners died in the culmination of the (ultimately successful) fightback against the withdrawal of political status in 1976. 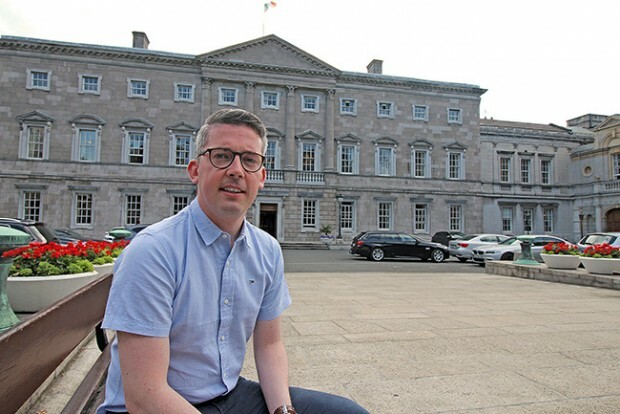 The newly-elected senator in the Oireachtas in Dublin, previously the youngest Mayor of Belfast and a councillor for the nationalist Short Strand enclave in unionist east Belfast, has grown up with the legacy of the struggle in the prisons and on the streets of Short Strand, where he still lives. It is a legacy that he is mindful of every day in a parliament that elected H-Blocks protesting prisoner Paddy Agnew and Hunger Striker Kieran Doherty as TDs in 1981. 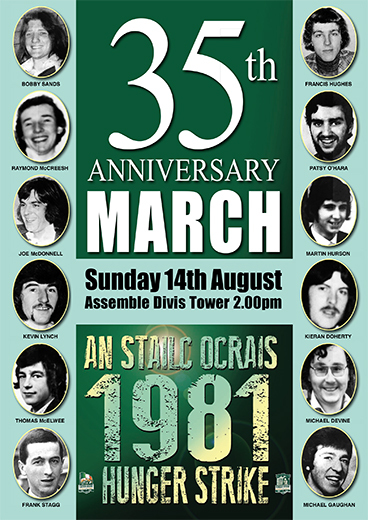 Neither of the republican prisoners could take their seats and ‘Doc’ died in the H-Blocks on 2 August 1981 at the age of 25. “I am a product of the era of the Hunger Strikers,” Niall says with a mixture of sadness, pride, humility and determination. On the two floors occupied by Sinn Féin’s 30 members of the Oireachtas there are images of 1916 and the H-Blocks Hunger Strikes. Niall may have been born after the H-Blocks struggle but he grew up with it all around him. And then there are the personal connections. “My father was in jail with Bobby Sands in Long Kesh; they were in Cage 11. “My da,” Niall laughs, “said there were times when he could have smashed the guitar over Bobby’s head in the Cages because he wouldn’t shut up playing and singing into the night when all my da wanted to do was sleep. “We have a telegram to my mother and father on their wedding day from Tomboy [Loudon] and Bobby. Síle Darragh, a neighbour, was imprisoned with Niall’s mother in Armagh. Síle later went on to become OC of the women POWs and, later still, Niall’s first election agent. Niall’s political adviser in the Seanad is Jim Gibney, who signed Bobby Sands’s by-election nomination and ran Bobby’s election campaign in 1981 with the National H-Blocks/Armagh Committee. In recent weeks, Niall’s uncle, Seánie McVeigh, passed away. He was a protesting prisoner whose time in jail had taken a terrible toll on a much-loved character. “Seánie used to tell me about Raymond McCreesh brushing up on his Irish and encouraging Seánie to persevere. 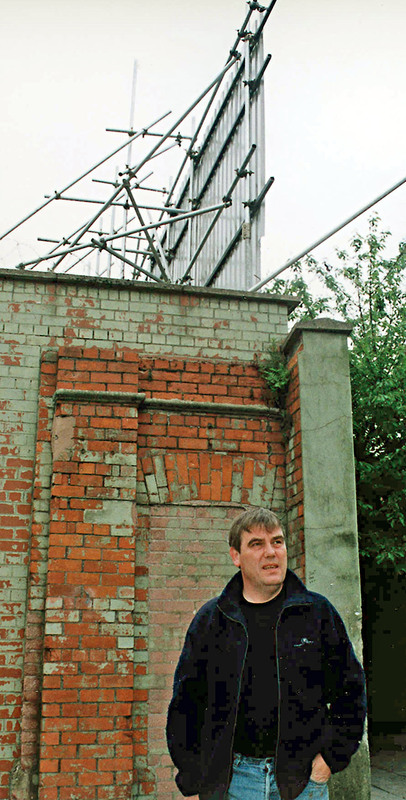 “When you’re stood at the bar in St Matthew’s in the Short Strand and Seánie is telling you about peering through the gap in the cell door and seeing Francis Hughes being pushed up the wing to be taken to the prison hospital, and he has his fist in the air and he’s telling the boys to keep going, that’s something that hits you like a bullet train. “Kieran Doc from Andytown is another iconic figure for me because I heard all the stories about him from Seánie about the sheer size, spirit and courage of the man,” Niall says with undisguised admiration. Niall recalls going to the commemorations for the Hunger Strikers, including rallies at Dunville Park, and the streets lined with black flags in memory. 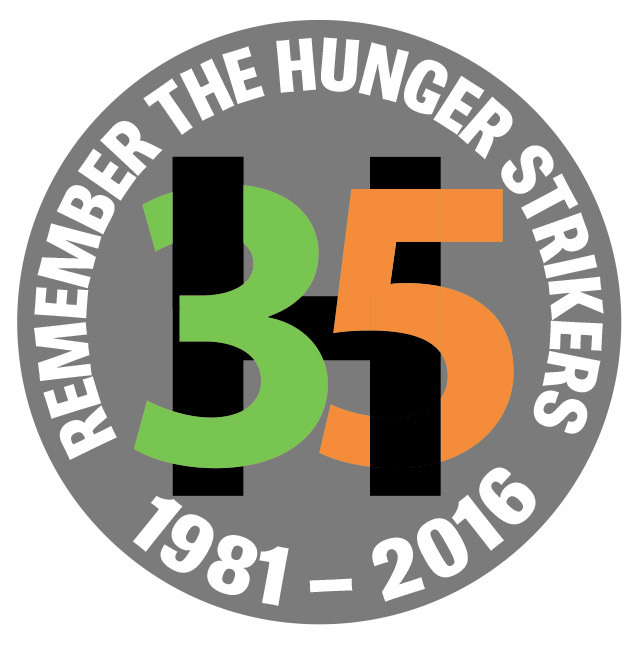 Now there are new ways to keep alive the memory and the legacy of the Hunger Strikers, Niall believes. There is, of course, the day-to-day hard work of still trying to transform society. There is also, alongside that, the promotion of the republican ideals epitomised by the Hunger Strikers’ selfless sacrifice for their comrades and their people. “The very first book I picked up for myself outside of school was The Prison Diary of Bobby Sands because it was in the house and I wanted to understand, to learn. It resonated with me; it inspired me, particularly Bobby’s clear grá for the Irish language and how that gave us a great sense of our Irish identity. Political debates inside Long Kesh and Armagh weren’t just occupational therapy for the prisoners, Niall notes. Niall Ó Donnghaile regards himself as “in some ways, a direct product” of the struggle waged by the H-Blocks/Armagh generation. “I’m a product in the republican view that I am a citizen,” he explains, “of being involved in your community, of having a stake in your community, of striving to learn and reinvigorate the Irish language. “I’m not alone in that,” he hastens to add, reeling off a long list of occupations and roles in the community, “where nationalists of my generation are thriving, growing and sharing the laughter of our children”. Republicans “are not taking anything for granted”, he says. “There’s not a set of eyeballs in these institutions that we cannot look into as proud republicans and say we are here to deliver change, for our communities and for the people whose sacrifices got us this far – the Kieran Docs, the Bobbys, the Maireáds, the Pat Cannons [Niall had spoken that weekend at the 40th anniversary commemoration for the Dublin IRA Volunteer], and all our patriot dead. “That is important to me. And I’m also appreciative that my generation is growing up in a transformed society, in a different political dynamic because the era of the Hunger Strikes changed things completely. “We are on the democratic route to national self-determination, so for us to be able to deliver on that we have to be in theses institutions or we leave it to the likes of others – the Fine Gaels or the unionist parties whose histories and ethos are often overlooked or airbrushed by the media. The seanadóir from the Short Strand is sensitive to the symbolism of republicans’ roles in once-reviled institutions, in the corridors of power, previously bastions of privilege or oppression. “My grandfather was an IRA Volunteer interned in the 1940s. Even though he was a very progressive thinker and very firmly of the Left, his view and that in the house I grew up in generally was that the only decent future for Stormont was to level it after the decades of unionist repression of nationalists that was turned a blind eye to, if not encouraged by politicians at Westminster. “There is a danger of a narrative that is still trying to be peddled of republicans being responsible for the conflict in the Six Counties – not that it was the product of a sectarian, gerrymandered, one-party police state that suppressed the civil rights movement. 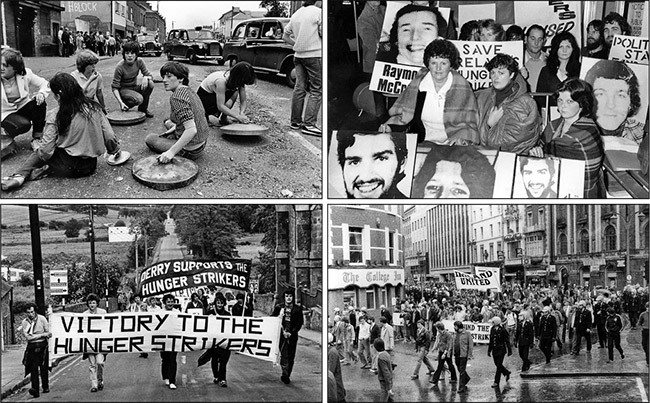 That is the Stormont regime that created the society the Hunger Strikers and generations before and after grew up in. "Now things are changing but republicans are not about airbrushing anyone’s history," he insists. “There is a new dispensation. All we are doing is demanding equality, and I don’t think that’s too much to ask. “We are reclaiming Stormont for people, for everyone. We are reclaiming councils for people. We are reclaiming Leinster House for people. “To me, these are just buildings – it’s the mindsets of the people in these building is what matters in the long run to the citizens outside of the fancy gates of these institutions. “I think that if we keep on the road of doing what we’re doing we will deliver on the vision of Bobby Sands and his comrades.